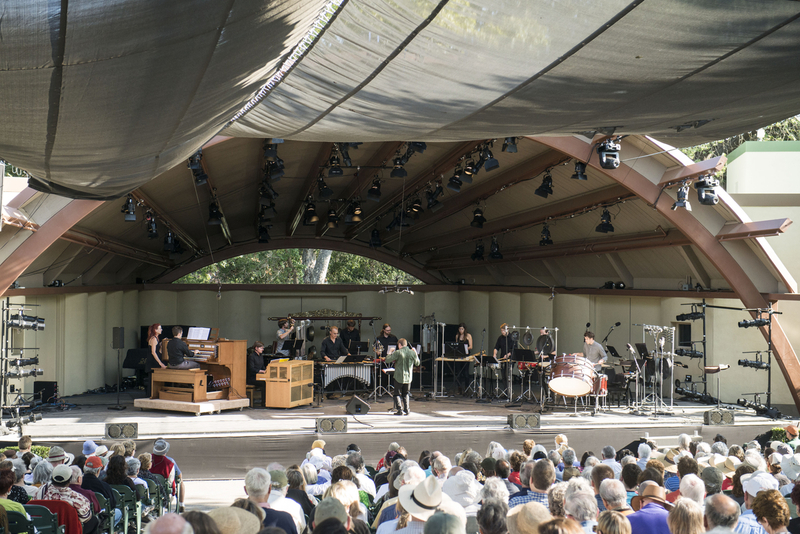 In today’s Orange County Register online, I review this year’s Ojai Music Festival, which was curated by Mark Morris. Click here to read my review (subscription or $2 one day pass required), or pick up a copy of today’s newspaper. Note: I really did not have adequate space to do the festival justice, which was frustrating. I could say more here (and may at some point), but suffice to say I had a really good time. If you ever decide to go yourself, I recommend going whole hog and stay in town for the entire festival. Next year’s music director is pianist Jeremy Denk. photo: Conductor Joshua Gersen, Colin Fowler and red fish blue fish perform Lou Harrison’s Concerto for Organ with Percussion Orchestra at Libbey Bowl on June 9, 2013 in Ojai, California. Copyright Timothy Norris. I think that was a spectacular job of distilling as much of the weekend as you did in as little space as you had. Seriously. Bravo. In fact, play it again. . . . The response to the John Luther Adams piece was really interesting, and everyone was talking about it (the piece and the response) for the rest of the festival. Ojai audiences don’t usually react that way … to anything. I’m glad to have heard the piece though; I’ll certainly never forget it. Thanks, regarding your kind words on my review. When I was writing it — about halfway through — I double-checked with my editor in regard to space. I found that I wasn’t halfway through. I was done, in terms of the amount I would be allowed to write. So, I cut and redid a lot of what I had already written, and then just left out a lot. Sigh.